The world is changing and these are challenging times, with the insistence of clarity within our public bodies and possible changes afoot as we leave our European cousins. The ancient obligations of the Burgage Holders of Alnmouth Common are changing too and we are attempting to rise to the challenge of our role in modern day Alnmouth whilst holding true to our core beliefs. Our new website will, we hope, make interested parties aware of the work we do, not only in conservation and maintenance of the common land, but how we support local charities and village organisations. Take a moment to browse our website, it too will be ever changing, as we get used to modern technology we will be able to bring you up to date with both Village and Burgage happenings and news on a regular basis. The Burgage Holders of Alnmouth Common like to work closely with both local and national environmental groups and Government agencies in an effort to preserve and promote natural habitat encouraging species of wild life to flourish on the common land. At the moment we are working on improving the marshland with the help of the A.N.O.B. and Coast Care. You will have noticed that some areas have been cleared making way for new Spring growth. Keep an eye out to see if our specially created habitat is attracting more wild life. The area may have been inhabited before but, like Milton Keynes and Peterlee, Alnmouth started life as a New Town, although a 12th century rather than a 20th century one. Strips of land, or burgage plots, were marked out each side of the main street for the burgage holders to cultivate and live on, in addition to which they had certain privileges, one of which was the right to use the town’s common land. Today the owners of some properties in Alnmouth still have rights over the Common, but these days it is the right to use it in a way conducive to modern life, rather than for grazing cows. Likewise, the role of the Burgage Holders has evolved into one of protecting and maintaining the Common for the enjoyment of all the village and our visitors as well as supporting financially a wide range of local activities and organizations. The Committee give their time freely in order to help protect the Common for future generations. We hope these pages will give you a flavour of some of the things the Burgage Holders are doing these days in Alnmouth. Alnmouth has a strong active community, we were able to celebrate that fact with our very first Hullabaloo on the hill. A day of music, magic and mayhem, enhanced by WI teas and prosecco (by the Hindmarsh Hall) the sun shone all day, despite having the wettest two days this summer before and after. A lovely day for old friends to catch up and for new friends to be made, we even finished up with a bit of dancing in the tipi. Thank you to everybody who attended, you made our first event a great success! 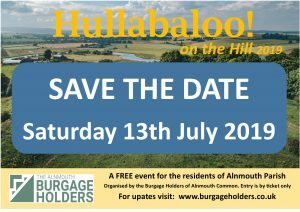 Hullabaloo 2019 is on Saturday 13th July. Check back here for more information !